Dates of birth and death unknown. Disciple of Nakamura Kumetarô I, he held the name of Nakamura Kichinosuke between the 11th lunar month of 1766 and 1800. he was first an iroko then became a minor wakaonnagata. Dates of birth and death unknown. Disciple of Nakamura Tomijûrô I, he held the name of Nakamura Kichinosuke between the 11th lunar month of 1773 and 1775. No record afterwards. Dates of birth and death unknown. Relationship to the Nakamura clan unknown. He was first-recorded as performing in Ôsaka in kodomo shibai from the 1st lunar month of 1817. 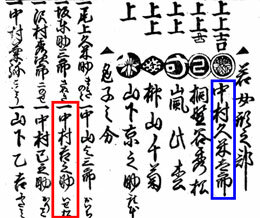 A few records afterwards up to 1835 but it was not clearly clarified whether or not the 1835 Nakamura Kichinosuke was the same actor as the 1817 Nakamura Kichinosuke. A minor actor held the name of Nakamura Kichinosuke between 1901 and 1920. The actor Kataoka Matsutarô held the name of Nakamura Kichinosuke I from June 1921 to October 1925. Born in Tôkyô the 20th of May 1933. Son of the owner of a famous eel restaurant in the district of Kudanshita, which was a favorite eating place for the star Nakamura Kichiemon I who accepted him as a disciple. He made his debut on stage in December 1946 and received the name of Nakamura Kichio, performing at the Mitsukoshi Gekijô in the dance-drama "Kioi Jishi". He took the name of Nakamura Kichinosuke II in September 1955 at the Kabukiza, performing in the dramas "Nijô-jô no Kiyomasa" and "Shôchikubai Yushima no Kakegaku", which were staged within a special program commemorating the 1st anniversary (2nd memorial service) of the passing away of Nakamura Kichiemon I and also celebrating the shûmei of Nakamura Sen'ya II and the hatsubutai of Nakamura Yonekichi IV. In 1961, following his second master Matsumoto Kôshirô VIII and others actors, he left the Shôchiku Company to sign an exclusive contract with the Tôhô Company. The Tôhô Kabuki troupe lasted 11 years and Kichinosuke went back to the Shôchiku Company in 1972. He was also a mainstay at the National Theatre. He performed in January 1978 at the Kabukiza in the dramas "Ichijô Ôkura Monogatari" and "Ohama Goten". He left the Kabuki world afterwards. The actor Nakamura Kichinojô III held the name of Nakamura Kichinosuke III from April 1994 to August 2016.